Source: CICH graphic created using data adapted from Friendly, M., Grady, B., Macdonald, L., & Forer, B. (2015). Early childhood education and care in Canada 2014. http://www.childcarecanada.org/publications/ecec-canada/16/03/early-childhood-education-and-care-canada-2014- July 24, 2017. 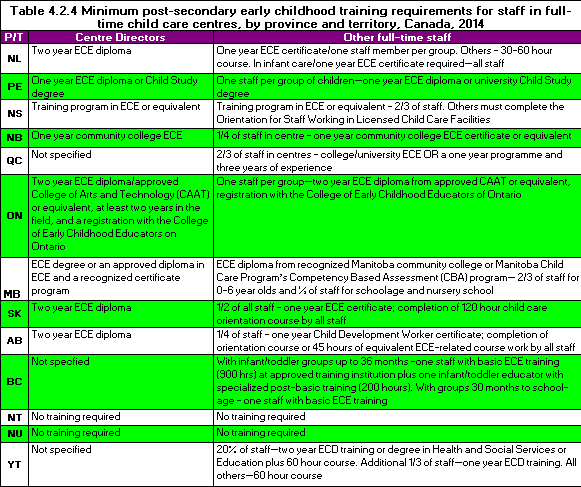 The requirements for education of staff in full-time child care centres varies across Canada. For centre directors, the requirements vary from no training to two-year Early Childhood Education (ECE) diplomas or post ECE diploma education. For centre staff, most provinces and territories require a proportion of the staff to have formal education – although in two jurisdictions, no training is required.